Look. Gretchen Carlson’s Title VII civil-rights lawyers do not have to look far to find evidence of how Gretchen’s been treated as a sexual commodity selling bad boy/moralistic mama in 2016’s horse-race politics. MSNBC follows Roger Ailes’s recipe in a New York Times advertisement, making Nicolle Wallace the centerfold. 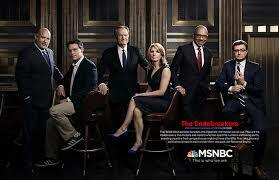 The MSNBC producers – the supposed opposite of Fox News – present their “Codebreakers” with pride. The code, to me, seems to be protecting our commodification of women newscasters. It’s more akin to custom keepers, not breakers of any idea or thing. Whether it’s covering or uncovering women, it’s neotribal to me when both supposed sides of the supposedly polarized news treat their women* the same way. Bare or veiled, it’s all about commodifying women. Isn’t this what Gretchen’s brief describes, protesting sexual discrimination? MSNBC producers cannot see or sense how out of sync they are. Oh, I forgot, they fired Melissa Harris-Perry when she complained about her show being bumped one time too many for the 2016 political-circus travesty, when she too was discussing politics. Perhaps Hillary Clinton’s insistence on wearing pantsuits is cheeky and counterculture after all. * Token outspoken progressive lesbians like Rachel Maddow exempted; she gets to wear pants and don sleeves in a different ad in this series. Oh, and I forgot the morning-show housewife who puts up with Morning Joe Scarborough’s put-down banter, who gets to wear unflattering sweater sleeves as long as those legs remain exposed. This entry was posted in Main Stream Media, Neotribal Media Moments, Neotribalism, Sexual Discrimination & Free Speech, Writing Politics and tagged FOX news, MSNBC, Title VII Civil RIghts Act, women newscasters as commodities by Professor Ruth O'Brien. Bookmark the permalink.